Since its inception in 2007, the Lunch4Life Committee has raised funds in support of local and national cancer charities through an annual event and auction. All proceeds are distributed to the designated recipients. 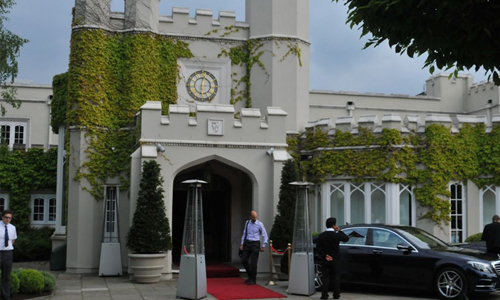 Our next function will be a fundraising ball at the Wentworth Club on Saturday, 12 October 2019, for the benefit of the Fight Breast Cancer Charity (Registered Charity Number 1146253), and Prostate Cancer UK (Registered Charity Number 1005541 in England and Wales, SC039332 in Scotland). Lunch4Life is driven by the experience of Lorna Ponti who, with the help of supportive and generous friends, is actively campaigning for improved services and breast awareness. The first two fundraising events were lunches, thus the committee adopted the name Lunch4Life. Lorna feels lucky that her cancer was discovered and treated - a hard journey, but worthwhile. All too many women discover too late because they are too frightened to get tested. These are the people we want to reach. Breast cancer kills more women under 50 than any other disease. We also wish to ensure that state-of-the-art equipment is available for the treatment of all patients of the Ashford & St Peter's Breast Unit. 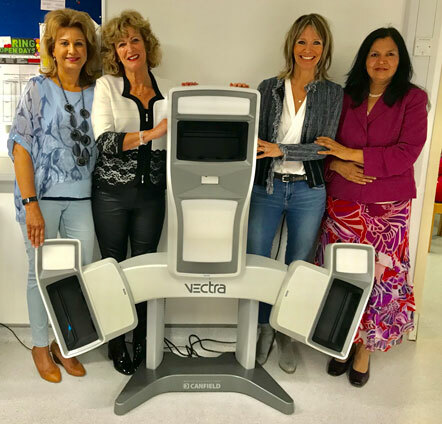 This Vectra 3D scanner (pictured) was purchased by Miss Sunita Shrotria, breast consultant and founder of the Fight Breast Cancer charity. This was made possible by Lunch4Life's fundraising efforts. It is housed at St. Peter's Hospital for the benefit of all patients, private and NHS. This modern machine provides a state-of-the-art 3D image of the breast and enables surgery to be carried out with precision. It provides automated measurements and detects volume difference of the breasts before and after cancer surgery. The 3D scanner carries no radiation and can be used for refining breast surgery, and can also be used for reconstruction in other specialities such as maxillofacial and ENT. Some of our donations to the Ashford and St Peter's Hospitals Charitable Fund have been put toward the purchase of a Hologic Tomosynthesis 3D Mammogram machine. The equipment acquires images of a breast at multiple angles during a short scan. This technology, combined with digital mammography, is proven to find cancers earlier and reduce recalls. Cancer detection is increased 51% across all ages and breast densities, compared to 2D technology. 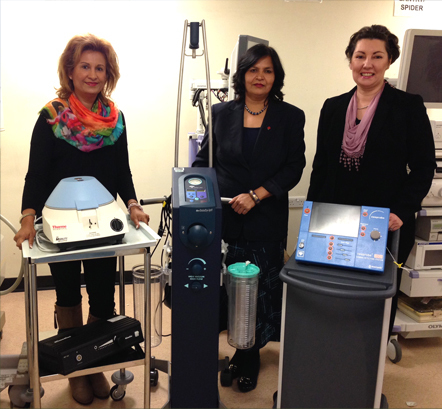 Funds raised in 2010 purchased equipment used by the Unit's surgeons in breast reconstruction, a Gamma Finder II Cordless Portable Probe, and a Bluetooth Sentinel Node Finder. The 2011 donation was used to fund research and to help purchase vital equipment and reagents for investigation into an important breast cancer gene. Money raised in 2012 enabled the purchase of bipolar scissors, which coagulate blood and seal the vessels as incisions are made. In addition, four portable laserlymphedoema machines were purchased. The invisible infra-red wavelength penetrates deeply into tissue, where it is absorbed by cells and converted into energy that apparently aids in reducing the swelling of post-mastectomy lymphedoema.